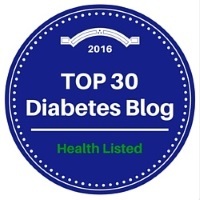 It is very apparent that low blood sugar levels are the worse… but the ones in the middle of the night are even worse. I am not the type who usually wakes up when these lows occur, like many other people seem to do. This causes an even bigger issue in my own life. I have dropped so low that I have spasms or seizures in the middle of the night, without even knowing! Last night, I was awoken by my boyfriend at 4:30am. Apparently I had woken him up. My body had been seizing, causing him to wake up, and he immediately knew my blood sugar was extremely low. This isn’t the first time, so he knew he had to run and get me glucose tablets, a glass of juice and hope that I would snap out of it. I tend to be mean and aggressive in my state of comatose, or extremely low blood sugar. I do not remember anything that occurred during that state either. According to my boyfriend, it took about a half hour for me to come back to my “normal” state. I had been arguing with him and refusing to check my blood sugar level. After having a glucose tablet, a glass of juice and going back into consciousness, I was finally able to check my own blood sugar level. I was 47 mg/dL. Wow… what could my sugar level have been at when I was out of it?!? 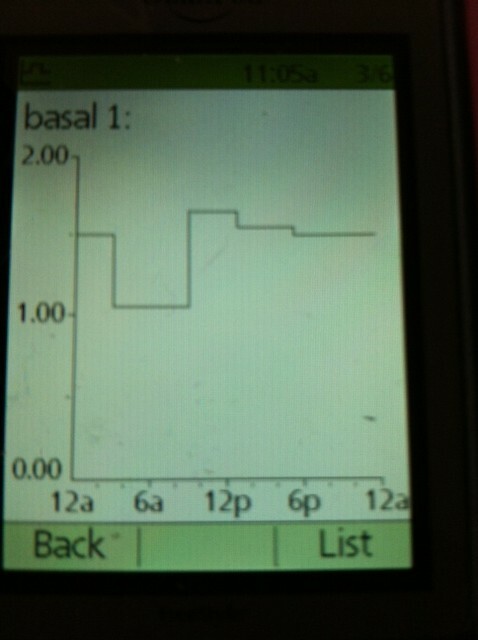 This is my current basal rate (or amount of insulin I receive each hour from my insulin pump). Adjustments have been now made, so I no longer have extreme lows in the morning! Now that I am aware of what happened in the middle of the night, I need to think about what to do so it doesn’t happen again. I need to lower the amount of insulin (basal) I receive throughout the night, I need set an alarm and actually wake up at 2am to check my blood sugar level and I need to thank my boyfriend for being the greatest and helping me out of a bad situation. God bless you and your boyfriend! How scary for you Calla, glad you are OK.
Glad you’re alright, and it sounds like you have a good plan in place. Keep us posted! Your website provided us with helpful info to work on. You’ve performed an impressive activity and our whole group can be grateful to you. My husband has also been getting lows and his nightmare issues seem to be worse when he is stressed or worried. He has insulatard before he goes to bed. Again, heccan also become aggressive and argumentative and getting him to take food or drink is becoming increasingly difficult. It is upsetting to see someone in this situation and I will suggest he does an alarm and sugar check. Thanks for sharing. it is of some comfort to know I am not alone and this is just another sympton of the horrid diabetes. You are NOT alone! I’m glad my blog was able to help you out!